A community development enthusiast with interest in mobilizing people for community development programs, evolving strategies for special areas of community interventions and reporting of activities in the rural areas. Trained as a journalist, teacher and counselor - graduated from the University of Ilorin with a B. Ed Counselor Education Degree and Post Graduate Diploma in Journalism (PGDJ) from the International Institute of Journalism (IIJ), Abuja. Publisher of The Pride Magazine with special focus on education and Template News that covers rural areas in Kwara and Osun States. Worked as a reporter with The Rural News for a period of 5 years in Ilorin. Designed special documentary on television for local government areas in Osun State assessing developmental projects based on the benchmark of the Millennium Development Goals (MDGs) that were set to be attained in 2015. Developed a television program in 2008 essentially to meet the needs of adolescents whose period of growth are associated with exploitation, stress and storm. It was in collaboration with Nigerian Education Research and Curriculum Development Council (NERDC), Sheda -Abuja. The television show simplified and domesticated curriculum on sexuality education that became a darling of many homes in Kwara State. Covered the Office of Rural and Community Development in Osun from 2010 - 2014; when UNICEF various interventions and its replication by the state government in Osun rural communities were given adequate publicity using our medium -The Template. Initiated and mobilized people in Nigeria and Diaspora for the repair of hand pump boreholes and training of locals in its repairs in 12 local government areas of Kwara State. The water project achieved among other things -reduction in number of dysfunctional hand pump boreholes thereby increasing maintenance culture of the people, reduction in water borne diseases and improving the local economy (GDP) through alternative income for those trained for the repairs. New pumps were equally sunk in many locations with the Ajisaiye village in Moro local government area of Kwara State catching the attention of the world. Nigerian media gave it prominence with Channels Television using the story for three episodes of its flagship, Big Story. The initiative has repaired about 200 pumps and trained more than 120 youths across Kwara State. Humanitarian gestures include: provision of solar light with home appliances to Ogele Community in Igbaja district through collaboration with international partners in 2017; donation of two Computer sets to ECWA Demonstration School, Igbaja and Community LGEA Primary School Igbaja in 2017. Purchased a tricycle for the use of the community, particularly the newly refurbished health center. Payment of subject teacher in a primary school for a year in a primary school in Igbaja and other humanitarian strides. Developed a blue print for the development of his country home, Igbaja tagged *Igbaja Project. 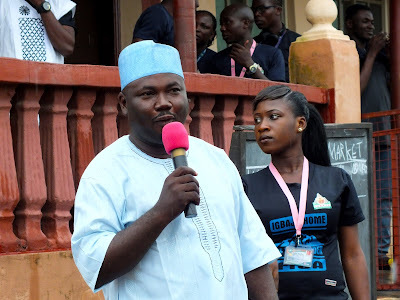 * The project sponsored the first ever Agbaja Football Championship in honour of Alhaji Abdulraham Ibiyeye, an incumbent High Chief of Igbaja who was Secretary of Igbaja Progressive Union (IPU) and Ward Councillor simultaneously for a considerable period of time. Through the project launched a book entitled *My Voyage Round Igbaja* and gave post humous awards to Late Pa Iranloye, Alhaji Mohammed (father of the incumbent Honourable Minister), Pa Shittu Offa and Pa Joseph Alaga in 2006. The event was chaired by a foremost lawyer, Chief P. A. O. Olorunnisola, SAN. Chief Executive of TREPS Media Services - undertook many political branding for politicains through collaboration and partnership. Started his political career in 1998 as the pioneer Ward Secretary of the Alliance for Democracy in Igbaja Ward . He was a member of Afenifere - the nucleus of AD then and attended several meetings of Afenifere including when Pa Abraham Adesanya chaired the 60th birthday celebration of Chief C. O. Adebayo in year 2000 at the Circular Hotel, Ilorin. Won the Councilorship primary in 2002 to fly the party's flag in Igbaja Ward 1. Magnanimously transferred the ticket to a brother, Hon. Kayode Adesina who was was eventually elected in an alliance between AD/ANPP. Was one of the three Coordinators of Lai Mohammed Campaign Organization (LAMCO) in Ifelodun Local Government Area, whose sole report formed the crux of the former gubernatorial aspirant's structure in Ifelodun Local Government in 2002. Was a Coordinator of Mohammed Dele Belgore Governorship Campaign in 2011. Was the House of Assembly candidate of the defunct Action Congress of Nigeria (ACN) for Omupo Constituency in Ifelodun Local Government Area in 2011. Was the pioneer Secretary of the political group (Kwara Unity Forum, KUF) of the Honourable of Information and Culture, Alhaji Lai Mohammed from 2005 - 2016. Was the Chief Coordinator, while working with two others to register members of the All Progressives Congress (APC) in Ifelodun Local Government Area of the State in 2014. Brain behind Caucus for Progressive Change (CPC), a pressure group within the All Progressives Congress (APC) that challenged the shenanigans of Saraki elements within the party during the nomination process of the Honourable of Information and Culture in 2016 and recently fought impunity, inequality and high handedness that put Saraki elements on the run. Served as Personal Assistant to Prince Williams Adewale Adeleye, Special Assistant to the President on Information and Culture, office of the HMIC until April, 2017. Recently, State Publicity Secretary of the All Progressives Congress (APC), Kwara State Chapter and member Media and Publicity committee of the party. Attended many workshops and seminars in Nigeria and overseas, such as Teachers Without Borders in Accra, Ghana (2010); Hand Pump Repairs and Community Participation, Ede Osun State (2012) Political Parties and Manifestoes Abuja (2014) organised by IRI among others. Delivered lectures in many fora and conferences. Enjoying marriage with a woman of quintessential support for development.